0-1 Global time in seconds (LSB first). 2-3 Battery Voltage in milli Volts (LSB first). 4 Charging current in Ampere = value/100. 5 Temperature in °C of battery 1. 6 Temperature in °C of battery 2. 2 Error type. 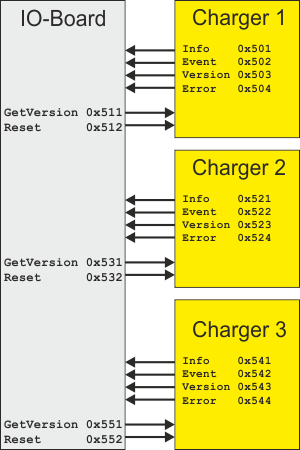 "Fatal system error" or "Charger error"
3 In case of "Fatal system error" this is the system error type. Otherwise it is the charger error type. 4-5 Error argument 0 (LSB first). 6-7 Error argument 0 (LSB first). This page was last edited on 8 October 2013, at 10:07.